This one is a little tough because it is one of the lesser Bonds. It has it’s qualities but most of them are not particularly unique so it might sound a bit familiar as we go along here. This is one of the few times in the series that a large part of the action takes place in the states, and the setting of Las Vegas was novel for the time. Bits and pieces of the era creep in and make it one of the more dated stories. It feels like a cheat to include the theme song in so many of my lists for this project, but Bond fanatics know that the music in the movie is one of the draws. This was a triumphant return of Shirley Bassey to the fold, and she does a silky smooth opening song that mixes electronic instruments with a great bass riff. If they tried this today they would be crucified. 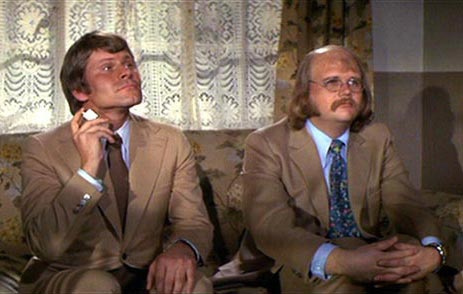 The secondary killers for Blofeld are a couple on near mincing homosexuals that are exploited for laughs more than for the danger they present. It is politically incorrect, but it was one of the first times I’d encountered a gay character in any fistion, so it was memorable to me. Wint and Kidd are closing up the smuggling pipeline and killing all the contacts along the way. They try to get Bond a couple of times, but never manage to do a credible job of it. 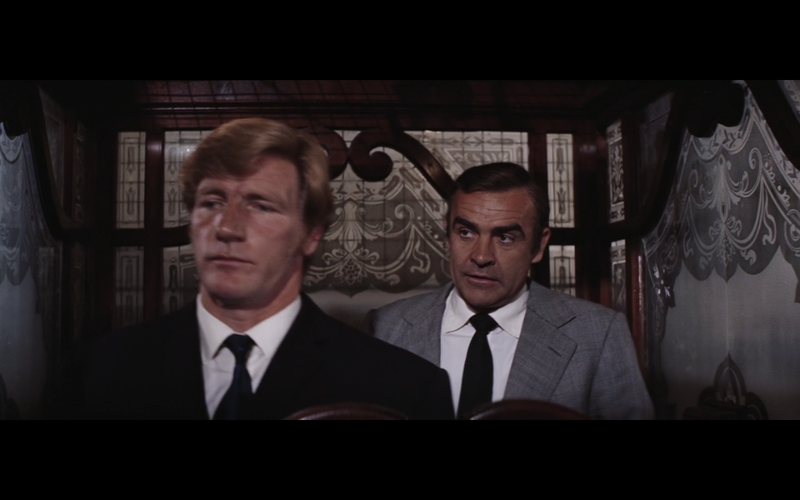 Mr. Wint’s perfumery cologne gives him away at the end of the film.Bond does him in with his own bomb cake and a suggestive handlock between the legs that is another gay punchline. At least Mr. Kidd gets a more dignified death, if you consider immolation to be superior. James Bond in the movie is different from the books in a number of ways, one of which is his play with language. Although the puns and risque wordplay are tiresome in the Pierce Brosnan films, they still worked coming out of the mouth of Sean Connery. I did not get this joke in 1971, I was thirteen at the time. Years later I almost busted a gut when i heard it again. Here is another one from the film that I did not get the first time around and now it would get a spit take from me. It is hard enough to make a movie, much less one where everything needs to be consistent. Bond and Tiffany are chased through old Las Vegas in their Red Mustang. 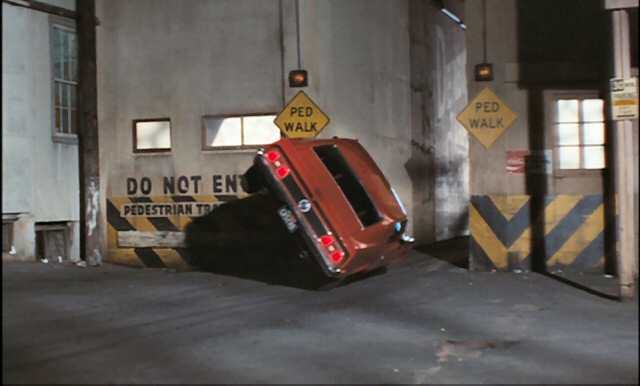 In order to escape at one point Bond drive up a ramp, tips the car on it’s side and drives through a narrow pathway that the cops can’t follow through. All well and good, except when he comes out on the other side, there is a slightyly odd issue with physics that needs to be explained and never is. Exactly how does the car come out the opposite way it went in? I’m not that picky, it was still a cool stunt. Singer Jimmy Dean plays a reclusive billionaire who is kidnapped but no one knows it. Why? because he has not been seen in public for a number of years before it happens. Those of you not familiar with the history of Vegas and Howard Hughes will miss the sly references and outright theft of some of his story. Like the fictional Willard Whyte, Hughes occupied the top floors of the hotels he stayed at. He actually bought the Desert Inn while living there to avoid more conflict with the management. One of the best posters of the series. For a complete discussion check out my post on Bond posters by clicking the image. Bond has a lot of hand to hand combat in the films. This was a unique fight because it was so brutal and it takes place in an old style open elevator. The conflict with smuggler Peter Franks has drama and a couple of black humor bits because the quarter are so close the combatants can’t get much momentum or leverage with one another. The best sequence in an otherwise less than thrilling film. Love this, Richard! You will get no argument from me (well, from maybe our friend Fogs 😉 ). 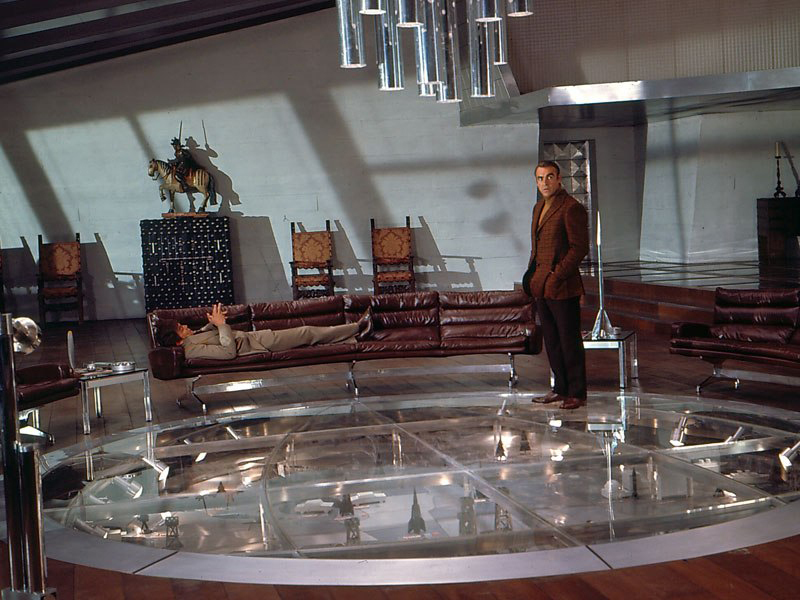 Everything you cites here the best and most enjoyable things in this lesser Bond flick, and Connery’s initial return to the role. Well done. Thank you sir. It is my pleasure proving your taste is correct.